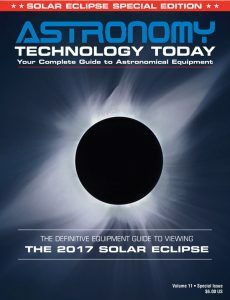 As the nation’s premier astronomy exposition, the Northeast Astronomy Forum serves as an excellent venue to network with amateur and professional astronomers who utilize iOptron products. This past NEAF I had the pleasure to meet Dr. Josh Walawender, Support Astronomer at W. M. Keck Observatory. Josh introduced us to the PANOPTES Project (Panoptic Astronomical Networked Observatories for a Public Transiting Exoplanets Survey) which searches for exoplanets with the help of schools and amateur astronomers. This is a citizen science project which aims to build low cost, robotic observing units which can be used to detect transiting exoplanets using the transit technique, the most accessible way to discover exoplanets. When the planet passes in front of its star, the star appears to dim, as some of its light is blocked by the planet (stars and exoplanets are too small to see image the transit, so only the total flux is measured). The dimming can be large (about one percent for a Jupiter-like planet), so it can be measured using relatively inexpensive equipment that amateur astronomers and schools can afford. By measuring how much and how often the star dims, the planet size and distance can be determined. 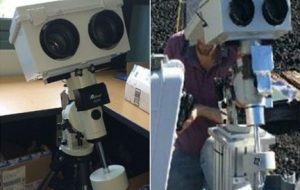 Shown left is an iEQ30 mount with dual camera set up. Shown right is the beta observation unit utilizing a iEQ30. Discovering exoplanets by the transit method is challenging because the odds are small that you will observe such an event when looking at a single star. The planet orbit alignment has to be just right (for most planet/star systems, the planet never passes in front of the star, but goes “around” it), and the transit does not last very long and may not repeat very frequently. Camera Box: The camera box encloses the two cameras and lenses along with an electronics (Arduino) board and a USB hub. One power and one signal (USB) cable come up through the mount to the camera box. The USB hub then splits the USB signal out to the Arduino and to both cameras. The power goes to the electronics board which regulates it down to the appropriate voltage for the cameras. The electronics board contains several sensors including the accelerometer to sense the orientation of the camera box. The Mount and Tripod/Pier: The PANOPTES baseline uses an iOptron iEQ30 Pro mount to which is added weatherproofing. The mount can either sit on the standard tripod, or on an optional PANOPTES designed pier for more permanent installation. A PANOPTES unit does not require a traditional observatory enclosure (e.g. a dome or roll off roof). It is designed to withstand weather when it is in its park position. This greatly simplifies the build and the software for the system. The Control Box: The control computer, power supplies, and supporting electronics all sit in a weatherproof enclosure next to the mount. A PANOPTES unit is designed to be self-contained, requiring only input external power and internet connectivity.